We are looking for additional sponsors! Fill out the form below, or contact Colleen Ahearn for questions at cahearn@lewisu.edu or (815) 836-5475. I'd like to sponsor the entire series! 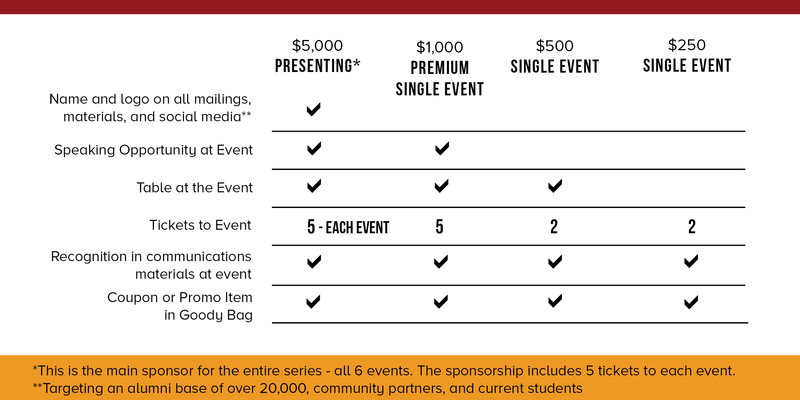 Sponsor all six events in the series. Thursday, January 31, 2019 6:30p.m.-8:30p.m. Thursday, February 21, 2019 6:30p.m.-8:30p.m. Thursday, March 14, 2019 6:30p.m.-8:30p.m. Thursday, April 18, 2019- 8:00a.m.-10:00a.m. Thursday, May 16, 2019 6:30p.m.-8:30p.m. Thursday, June 20, 2019 6:30p.m.-8:30p.m.